The cost for a full room addition can run from $200 - $400 / SQFT or more depending on the size and complexity of the attachment and other factors. If you are interested in a more extensive scope of work, such as including a bathroom to the addition, the cost increases a minimum of $20,000.00 and can go much higher. 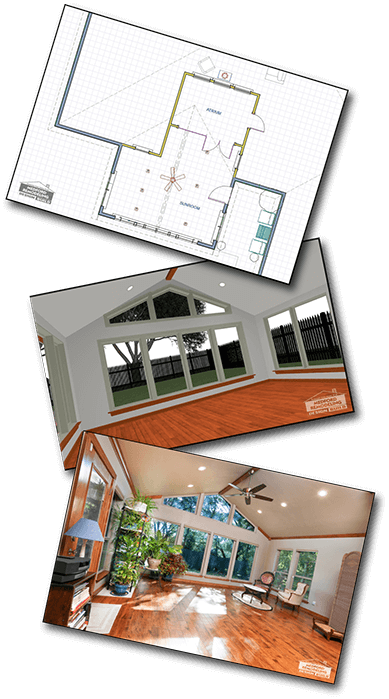 To find out exactly how much your room addition will cost, a detailed design plan is needed. These designs not only provide a visual for you, but also allow us to detail every aspect of the job and specify the cost of materials and labor. The package includes floor plans and 3D renderings of the new space, a Scope of Work document with cost and timeline required to complete the project, and a Budget Items Worksheet to break down the pricing allowance for your selection items. Our custom design package will allow you to see precisely how your new room will look once the construction is complete and give you a clear understanding of the project cost. If you are interested in a custom design package for your room addition, we are happy to create one personalized for you for a fee of $1.50 / SQFT of the new and existing affected area with a $1,500.00 minimum for the room addition. If a bathroom or kitchen is incorporated in the design, additional design fees may be incurred. The design package is initiated by signing a Design Agreement at your initial consultation. After the designs are completed, if you choose to move forward with having us complete the remodel, the $1,500.00 design fee will go toward the down payment of your project. You also have the option of only purchasing the designs and then using them to get bids from other contractors or continuing the project on your own. Having the plans already drawn provides you with confidence and protection when hiring, as each contractor will understand exactly what you expect and what is required to complete the job, lessening the likeliness of confusion, misunderstanding or misinterpretation of your project.